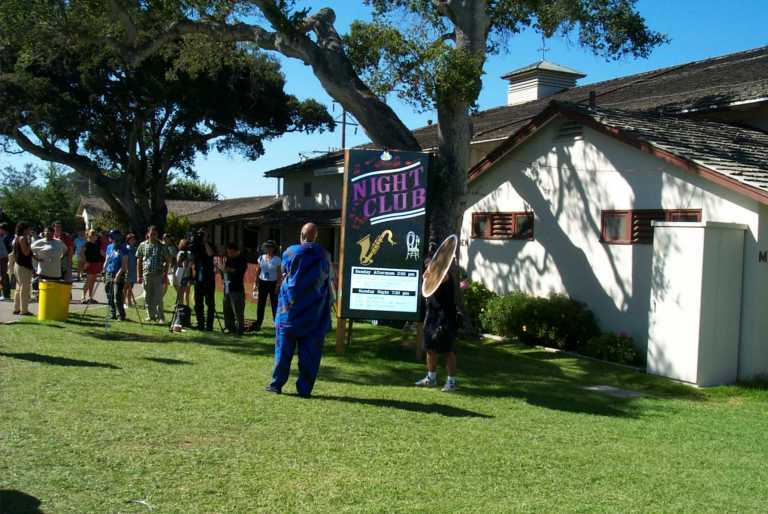 Some of these pictures I took from Jazz West's nice web site (http://www.jazzwest.com). Others I took from the Monterey Jazz festival site (http://www.montereyjazzfestival.org). 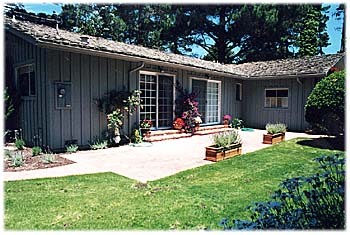 Still others I took from the Monterey Bay Property Management web site. I saw an article in Jazziz magazine (Thanks Mike K.!) 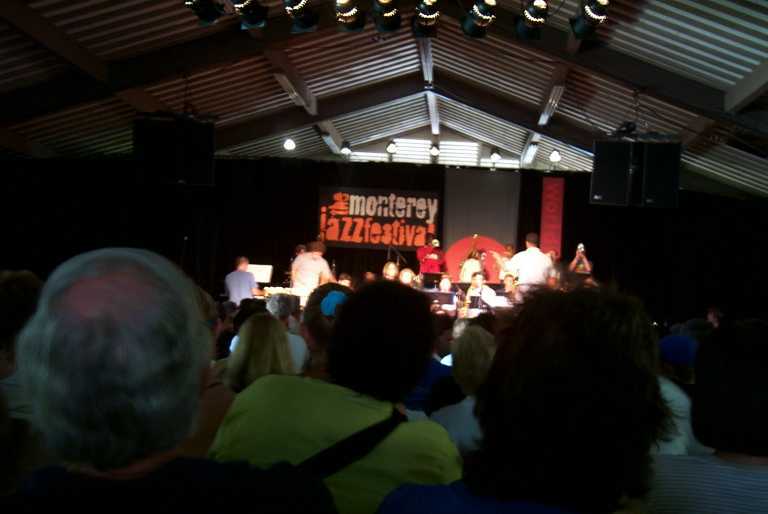 about 9 months ago about last year's Monterey Jazz Festival. I thought it would be fun to get tickets, or at least to get on the waiting list for tickets next year, or the next. 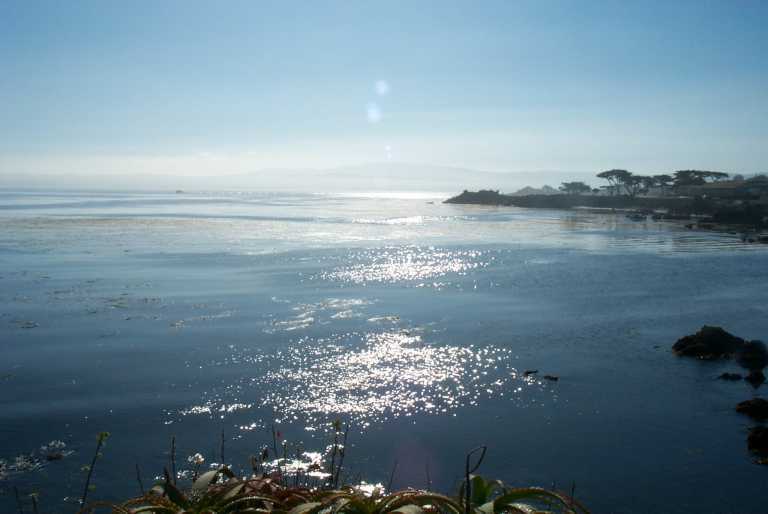 Maybe start a regular vacation in September to Monterey, that would be great! 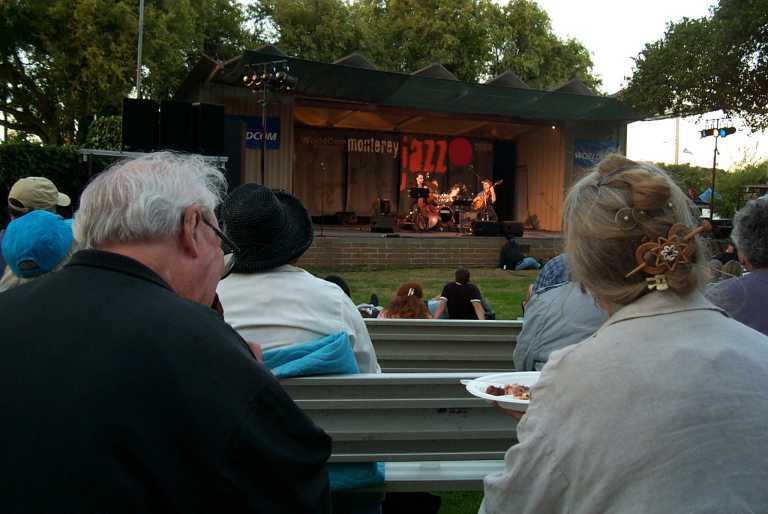 The Jazz Festival sells out early, and apparently has a waiting list for the tickets. I called and signed up for the waiting list and at the end of July they Fedexed us our tickets! Woo Hoo! 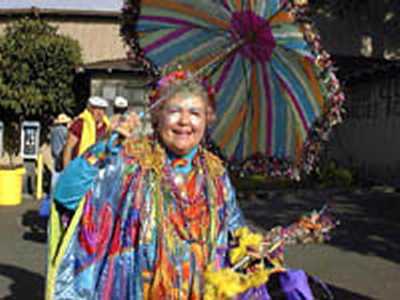 Held in Monterey, CA, this was the 43rd year. The festival is three days, with each day having day performances and night performances. We got tickets for all three days, both performances each day. 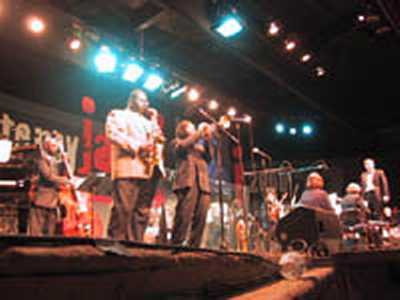 They have a complex schedule, with the Nightclub, Dizzy's Den, the Garden Stage which is outside, Coffee House Gallery, the Jazz Theater, and the big Arena, the Jimmy Lyons Stage where the main performances are held. Each of these stages have different performances going all day and into the night. Our start was a bit rocky. I had booked us some reduced rate flights that left Dallas Love Field on Legend Airlines, to LAX, where we picked up a American Airlines shuttle to San Jose. We drove down to Love Field with plenty of time to get there, but the traffic was _terrible_ getting out of Plano. It took 30 minutes to get from Spring Creek past Park, less than 3 miles! Luckily whatever was causing that traffic problem disappeared south of Park and we cruised on down the tollway to Love Field arriving about 30 minutes before the flight left. We parked in long-term parking and walked in only to find that Legend Airlines wasn't at the main part of Love Field! 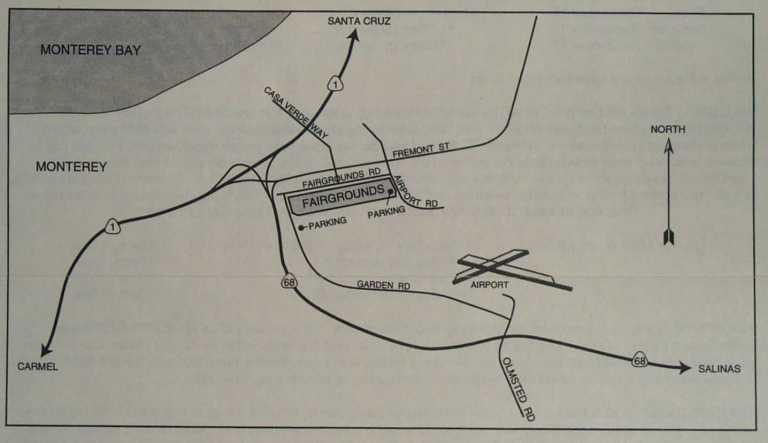 It had a completely separate hangar, terminal, and parking structure on the east side of Love Field. We had to race back to the car, pay and leave Love Field, drive around to the east side, park, and checkin to Legend. It felt very, very rushed but turned out Ok, we didn't miss the flight or even get very close really. Legend Airlines is _fabulous_. It is first class all the way. We had big leather seats with TVs, reclining seats with extending foot rests, free wine and champagne, and a first class meal with real silverware, china, and tiny little glass salt and pepper shakers. How do you spell "Spoiled" ? We arrived at LAX and had a bit of a walk around to the American Shuttle to San Jose, but plenty of time. It was a short 50 minute flight from LAX to San Jose and we touched down to beautiful weather. I can't really think of anything nice to say about National Car Rental. I made our reservations on the phone talking directly to them. On the phone I asked specifically for a Toyota Camry. She told me that the had various car makes and models and, although they do have some Camrys, she couldn't guarantee that they would have one for me. I said fine, I'd check when I got there. When we arrived at the National desk in San Jose I asked for the Camry. She said she didn't know what they had on the lot, we'd have to go out to the lot and take whatever we could find and wanted. Maybe there would be a Camry, maybe not. We walked out to the lot and they had all these GM Grand Am cars in the Intermediate Size Car Lot. We were both disappointed until we saw a white Camry in the very next parking row. I walked over to the attendent and told him "that's the car we want!" He said we couldn't have it, our reservation was for an intermediate car and the Camry was a full-size. He said I'd have to go back in and re-work my contract to get that car. That really hacked me off since I had asked for a Camry all the way through the reservation process and there it was on the lot ready to be driven away. They have clearly designed their process to push the disappointment off to the point where the customer is standing in the lot looking at the cars. Anne grabbed the key out of the Camry and stood right beside it while I raced back to the counter and had them re-work the contract. $ 3.00 per day more is all it took. Although I'm pretty surprised that a 4-cylinder Camry is considered a full-size car. So we ended up with a Camry. But National has lost a customer. We'll _never_ rent a car from them again. 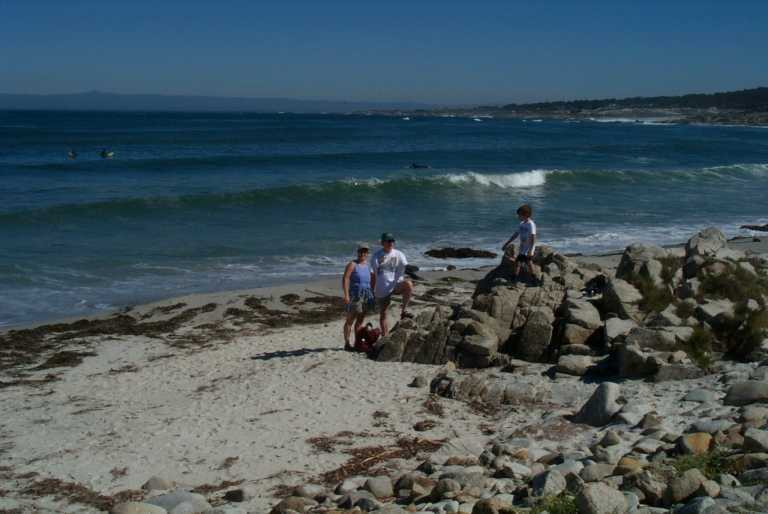 We drove down to Monterey and over to Pacific Grove where our house is. This is the exact same house that we rented 10 years ago for a relaxing vacation after working a long, difficult proposal. 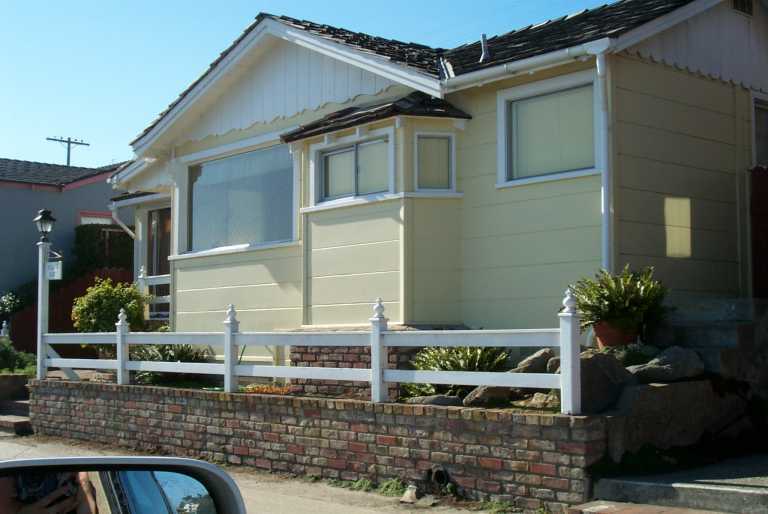 It was a small, 2-bedroom house on Ocean View Boulevard that was right on the Pacific Ocean, looking north into Monterey Bay. 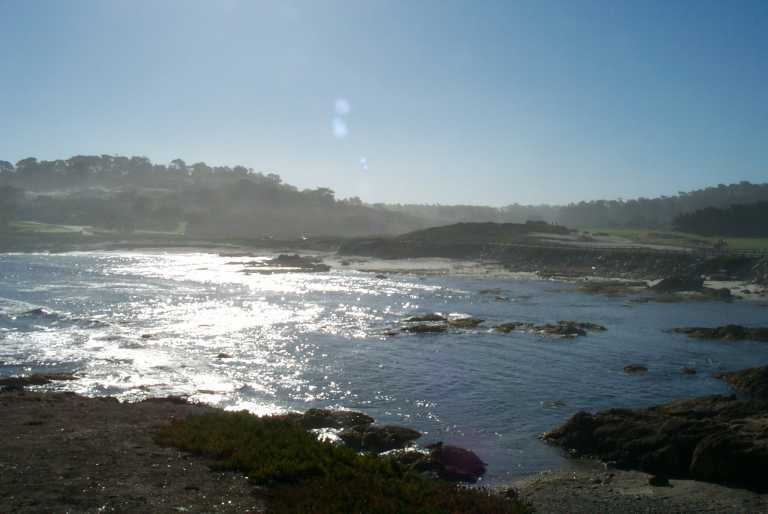 It is about 1 mile from the Monterey Aquarium along a beautiful walking path along the beach. We settled in, met our neighbors and talked with them for a while, then headed out for dinner and to pickup some groceries for the weekend. We drove down to Lover's Point (actually an easy walk from the house) and had dinner at the Tinnery. There was a huge Triathalon being setup at Lover's Point. While eating we saw vans arrive with sawhorse barriers. The barriers had signs on them saying Ocean View would be blocked off from 10pm Friday night to 4pm Saturday. The bikers would be biking Ocean View as part of the Triathalon. The swimming would be along the coast right out in front of the house! Although the triathalon would be cool to see, turns out access to our alley would also be blocked all day Saturday! Uh oh. 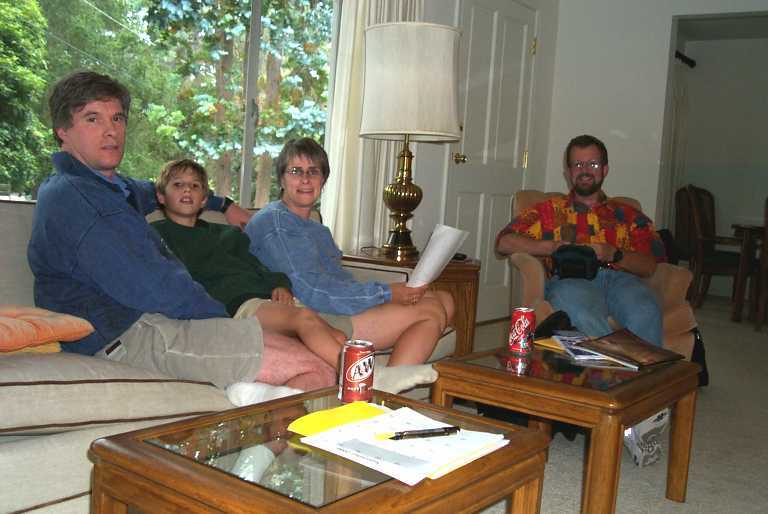 Our friends Bill and Jane and their son Connor were supposed to come and visit us on Saturday and stay the night. Access was going to be a problem. Figure out how we'd get to the house during the triathalon. 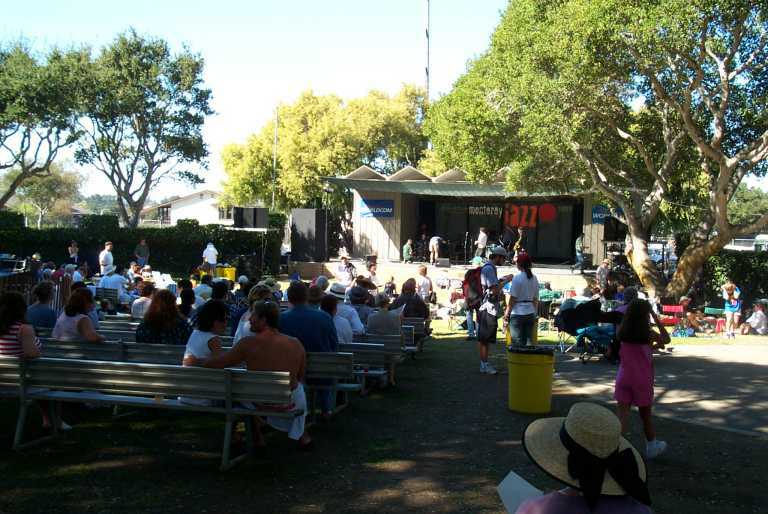 Figure out whether the Monterey-Salina Transit (MST) would be running shuttles to the Jazz Festival, or if there was normal mass transit there. Figure out what we wanted to see at the Jazz Festival. 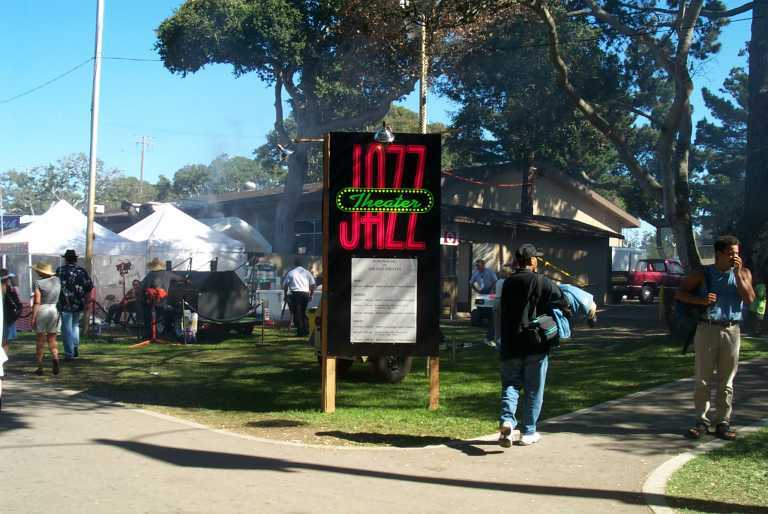 Go party at the Jazz Festival! 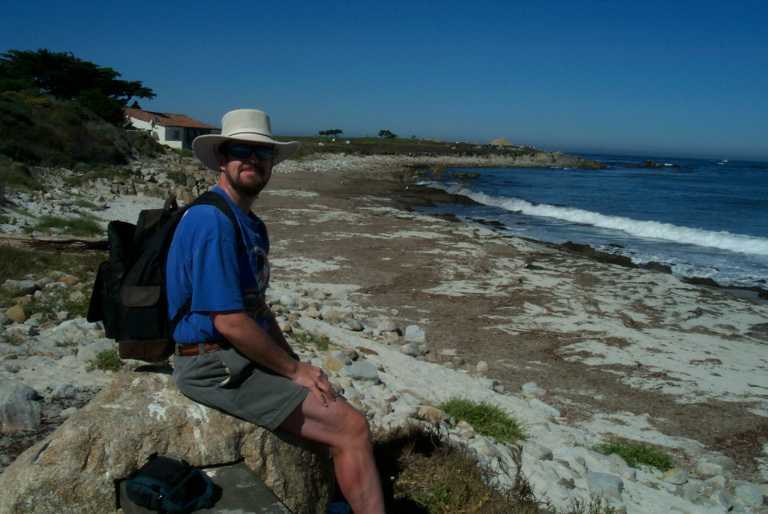 We had breakfast and had a nice long walk west around the point and up to the Point Pinos Lighthouse, then back through downtown Pacific Grove and on to Lover's Point. 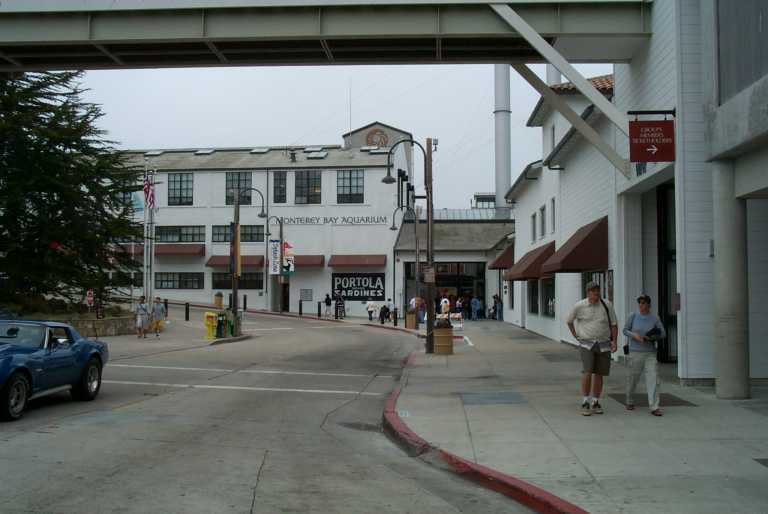 In Pacific Grove we stopped at the Chamber of Commerce and picked up an MST schedule. It didn't look so good for mass transit to the jazz festival. The MST stops running at 11pm and the festival goes well beyond that. So that was a bust. At Lover's Point we found one of the organizers busily planning Saturday's Triathalon. We asked about access and she said that the owner's had been sent "Resident Passes" to give them special privilege to get to their houses. Ok, great! That's exactly what we needed. We got the phone number of the triathalon organizers base station. She said call them, tell them what we need, and they'll bring one by the house. It had to be done quick, there was no time left to mail it or anything. We walked back to the house and started calling. We left a message on the triathalon organizers machine then called Monterey Bay Vacation Management. They're the folks we rented from this year and 10 years ago. I left a voice mail for our agent, Jan, then transferred to the "agent on duty", Jennifer. Jennifer didn't know anything about the resident passes but said she'd call the organizers and get back with us. Fine. A few minutes later Jan called having picked up her messages. She wasn't helpful at all. "We can't keep track of everything going on around the area. blah blah blah..." I pointed out that keeping track of access to the rental property was part of her job! She then offered to move us to another property. Anne and I discussed it and decided that was the thing to do. Jan said they had two 2-bedroom properties that were open. 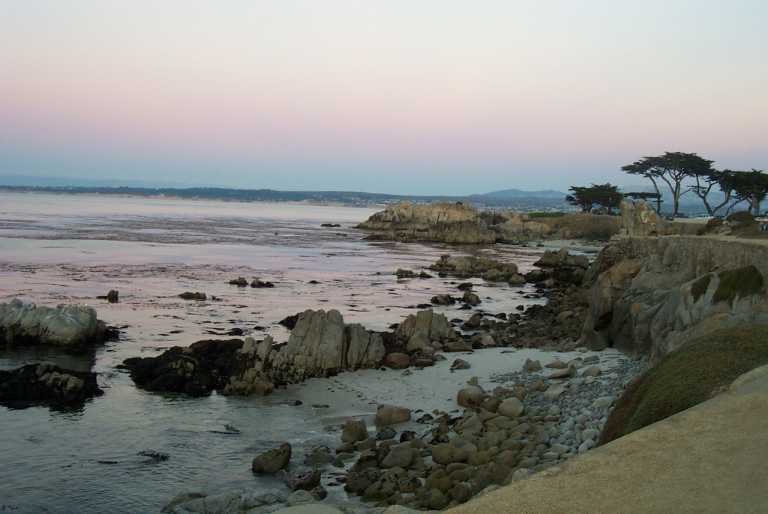 The one we chose was in the Pebble Beach resort, about 300 yards from the Pacific Ocean, right on 17-mile drive. Wow! 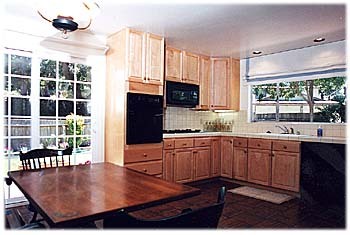 The house was newly remodeled, 2 bedroom, about twice as large as the first place, and much nicer. We settled in and started getting ready for the Jazz Festival that started Friday night at 6:30pm. We drove to the Fairgrounds and parked at the east end of the place. Parking turned out to be easy every time. 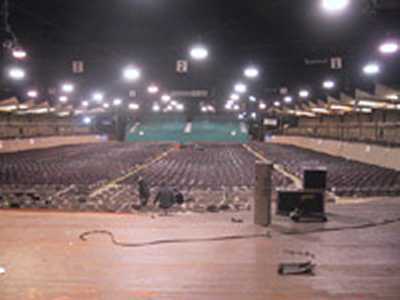 The Fairgrounds was small (compared to anything we had ever seen in Dallas). It was easy to see why the tickets were hard to get, so few people could attend. We headed to the Garden Stage to watch the Mimi Fox Trio. Anne has been reading local Monterey Jazz newspaper and a Monterey weekend cultural newspaper that we had picked up at Dinner on Thursday at the Tinnery. She had picked out a few performances where neither of us had heard of the performers. Mimi Fox was one of them. And her Trio was great! We got good seats at the outdoor Garden Stage and really enjoyed her set. We got a chance to see the famous Painted Lady, clearly a model for Drew Carey's Mimi! Then we headed over to the Coffee House Gallery to catch Bill Charlap and his trio. They were fantastic too! This was going to be a very good time! We could only stay about a half hour here before heading over to Dizzy's Den to watch Bill Frisell. We have two of this guitar player's CDs. I like his material and I was looking forward to seeing him. His set was Ok, but a bit disappointing. They weren't tight like I'd expect, and we sat way, way in the back. I also had a hard time seeing the stage. We stayed through 2 songs then hot-footed it back to the Coffee House Gallery to catch the end of Bill Charlap's set. Unbelievable live music! The "main event" at the Jimmy Lyons Arena Stage started at 8:30pm with Richard Bona. We missed that one, but came in at the start of Dianne Reeves set. Wow, it was great. She sang her "Hello, Monterey!" and had a marvelous set with beautiful music. 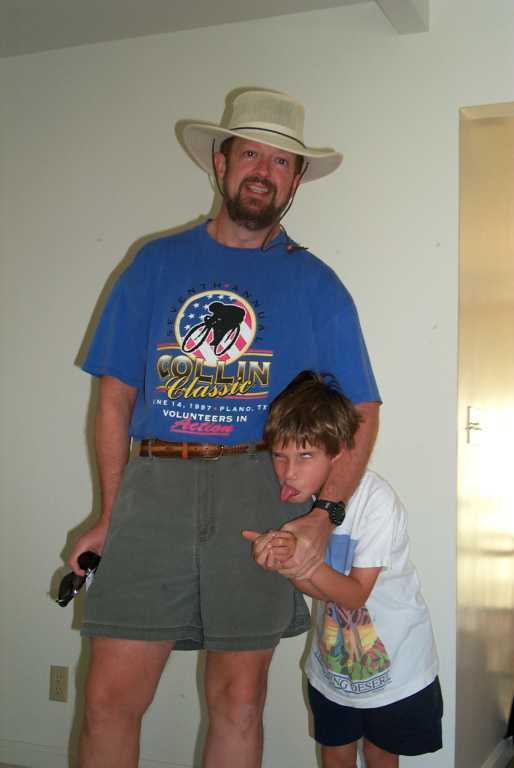 We were both still on Central time when Dianne finished at 10:50pm (12:50pm Central time). So we headed back to the house and crashed for the evening. 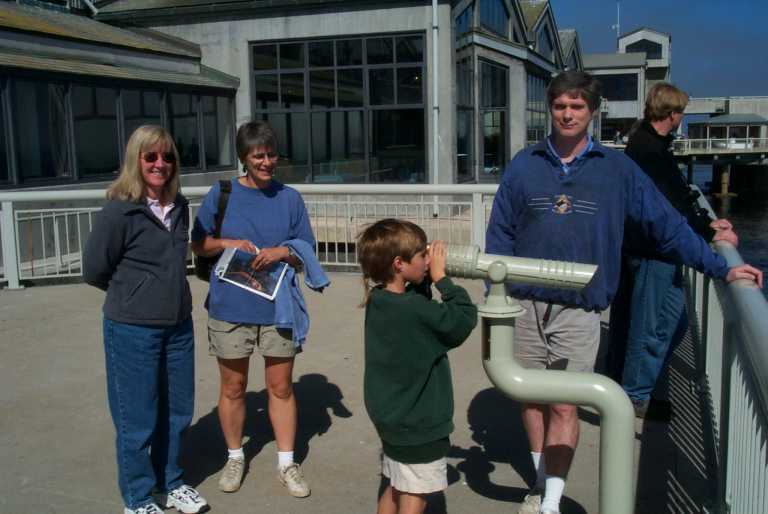 Our friends Bill and Jane and their son Connor met us at the Monterey Bay Aquarium Saturday morning. We haven't seen them in way too long. Connor is 8 and is a much larger version of the boy we saw in Puget Sound 2 years ago. 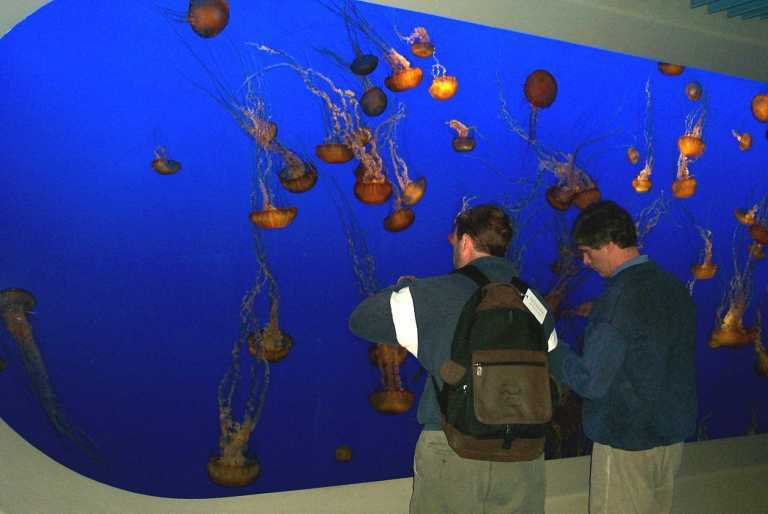 We met them at the Members Entrance where Bill and Jane signed up as members of the Aquarium. 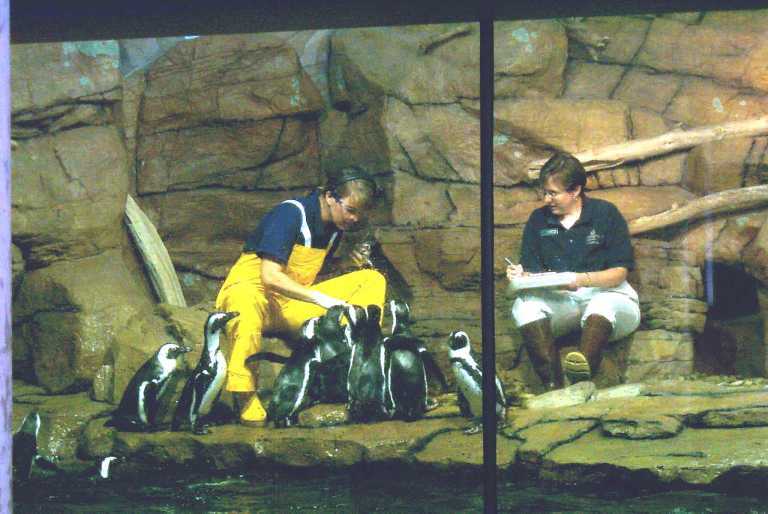 They then brought us in as guests and we wandered all around the aquarium. 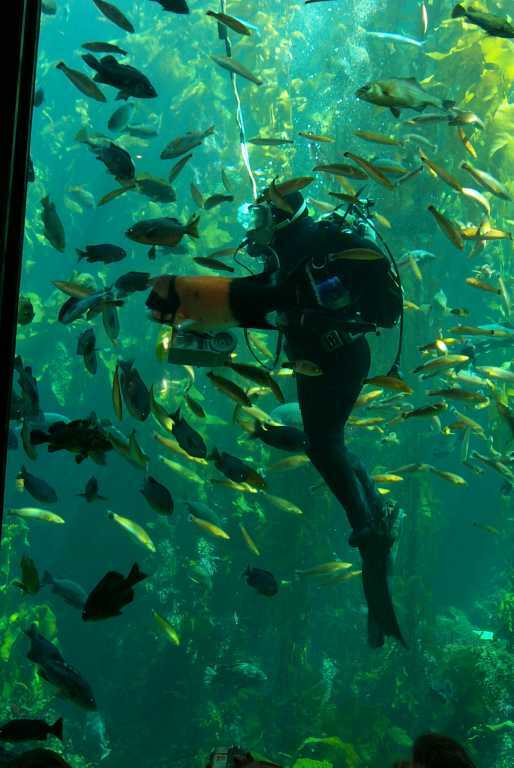 We managed to accidentally time it just right to see the feeding of the sea otters, the penguins, and all the fish in the deep sea tank (the largest tank in the world), and in the kelp forest tank where a man in a wet suit and diving gear dropped in to feed the fish and talk to us about the different species and their characteristics. He had to hold the food for the "bottom feeders", those fish that had their mouths on the bottom of their bodies. This included the sharks. He held the food for the sharks but he wouldn't get anywhere near the wolf fish (that name doesn't sound right...). He said it would latch on and not let go and had _very_ sharp teeth. We were very lucky to see all the feedings. We stayed hours at the aquarium and ate lunch there at their very good restaurant. 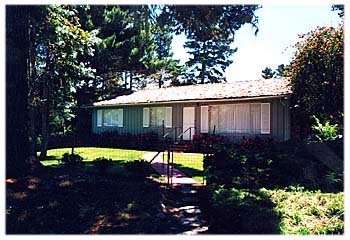 We then headed back to the house so BJ&C could get settled in and I could get a nap so I could stay up later tonight. Anne and I headed back over to the Jazz Festival about 6:30pm while BJ&C went to dinner. Tonight was not quite as wonderful as Friday night. We got some food and scoped out tonight's performances. Everything started after 8pm. The performers in the Arena Stage were scheduled to move over to Dizzy's Den after their set in the Arena. We went by Dizzy's Den and the lines were _long_ to get in for a seat. These were the people that didn't buy Arena tickets and could see the performers as they came off the Arena. The lines were pretty long everywhere tonight. We got in line for food and drink and ate near Dizzy's Den. Then we headed over to the Arena to hear Roy Hargove. Roy Hargrove's set was Ok, but there were definite sound problems. It was generally too quiet, and it was mixed weird. It also sounded like they had some kind of filter setup. The lower frequency tones were much louder than the higher frequency tones. And after a certain high frequency the instruments could barely be heard. It got better as the set progressed, but was a continuing problem on the Arena Stage throughout the festival. Also, Roy's first selection seemed technically difficult, maybe not the right thing to start with! And the musicians didn't seem tight, like they hadn't practiced together enough. hmmm... After his set we raced over to the Garden Stage to see Karl Denson's Tiny Universe. This was funk-tastic! They were tight, tight, tight, and it was mixed perfectly. We stayed through the entire set and bailed out, again too tired to stay for the scheduled 11pm performances. Today we had breakfast and headed out for a long walk along the coast. Connor had his kewl metal scooter and Bill had his kite. 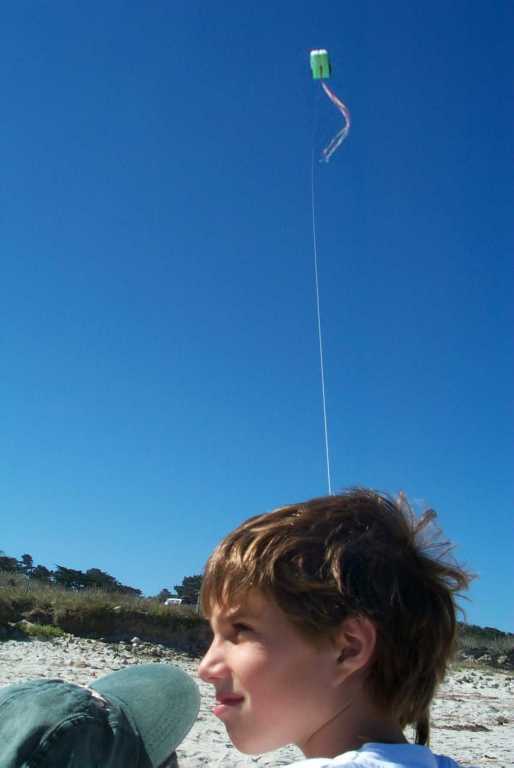 We walked down to the Spanish Bay picnic area and beach and flew the kite for a while waking and talking and scooting. It was great to visit with our old friends. We had lunch in Pacific Grove and Bill, Jane, and Connor headed home. Anne and I drove on over to the festival. Today is high school jazz band and combo day. 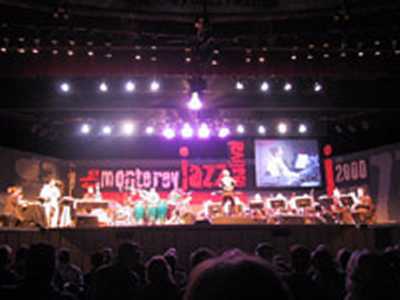 We heard the Berkley High School Big Band, the Rio Americano High School Big Band, and the Monterey County Honor Band. It was really fun to see the high school students both on stage and playing, and hanging around the festival soaking up all the good vibes. 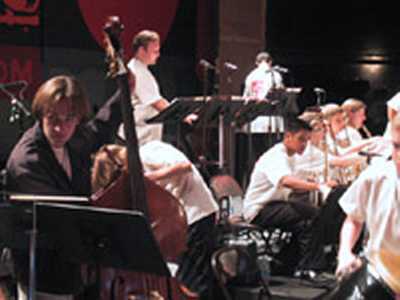 Each high school band featured their best musicians as soloists all through their performances. We really enjoyed seeing the soloists as they improvised. Anne said she could see the ideas form in their minds and come out their instruments. For some it was clearly raw and newly formed, others were more polished. I could see the differences between the professionals and the students much more clearly than I would have expected, and these students were _very_good_! We headed back (again) to the Coffee House Gallery to see a group called Maybe Monday . 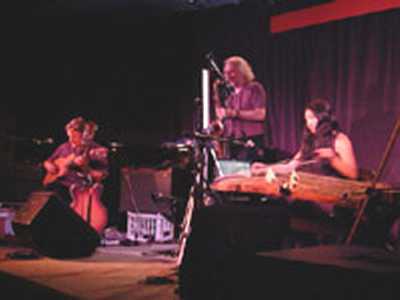 This was billed as avant garde jazz from the Bay Area. 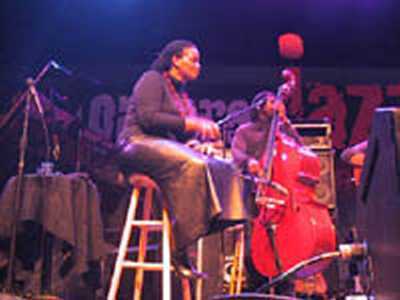 Three individuals playing sax, guitar, and some large, strange string instrument that was played like a steel guitar, but was about 5 times larger. I can best describe this as a woman swatting flies as a man tuned his guitar, and another man played random riffs on his tenor sax (swatting flies was breaking laser beams causing specific sounds to fire). It was very, very strange. I felt like clicking my fingernails when the song was over. We didn't stay long. In the evening we headed over to the Arena Stage to see Wayne Shorter. 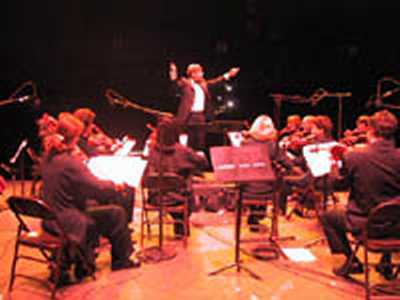 He was the guest artist who wrote the commissioned piece for the festival. Just like every other time, the mix was weird and the sound way too quiet. This slowly cleared up in time. His set was very good and the commissioned piece was superb performed with the Monterey Jazz Festival Chamber Orchestra. Pat Metheny followed Wayne Shorter playing in his trio format. After two songs he brought out Michael Brecker on tenor sax then after two more songs he brought out Bill Stewart on Hammond B-3 organ. His set was great. We watched the whole thing, then headed home again. This was the end of the festival. We had such a good time. I hope we can come back again. We leave today. Bummer. We were starting to get used to this. We decided to drive the 17-mile drive again. It had been 10 years and maybe we didn't remember everything. It was beautiful. We drove south to the gate, then turned around and drove north until it curved around onto Ocean Grove where our first house was. 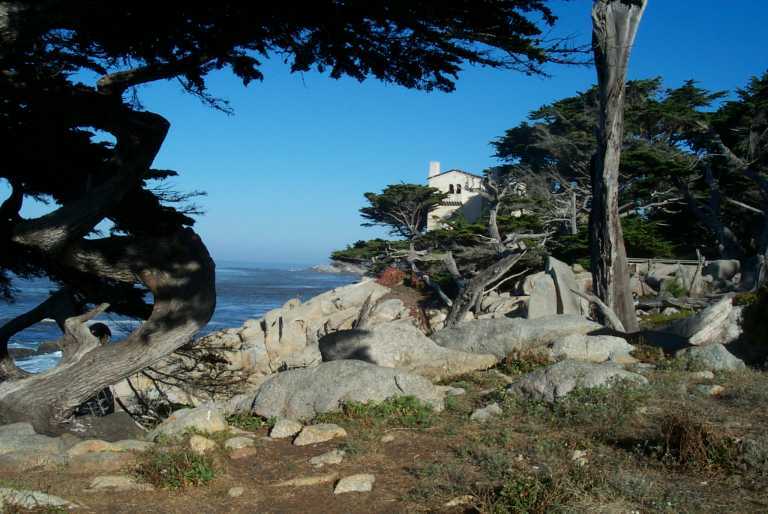 We drove back along the beach road and took a picture of the house, then on to Lover's Point, turned right back toward Pebble Beach and back to the house. We packed and headed north to San Jose to catch our United Shuttle flight from San Jose to LAX. We knew we were back in the rat race when we missed our turn to San Jose International Airport, then missed it again trying to find our way to the rental car return! Time was getting way short and I was starting to feel stressed with those non-refundable tickets and all. We got to the rental car return at 1:45pm, the flight out was at 2:15pm. We caught the shuttle to the airport and hurried to the United counter. They brought us forward past all the other travelers and we discovered that our flight was cancelled. We had been rescheduled on a flight 1 hour later. This made our layover at LAX 1 hour shorter. So we landed at 4pm and our Legend flight went out at 5pm. Too close, way too close. We landed at LAX and taxi'd to the gate arriving at about 4:10pm. We discovered that Legend was in terminal 5, we were in terminal 8, and it is a _long_ walk between these terminals. We didn't run, but we were walking pretty fast and got to the Legend ticket counter only to discover that the flight was delayed. We didn't get off the ground until 8:30pm! We weren't really late for any flight today. Everything was cancelled or delayed. What a pain in the rump, and how lucky we were! We got home at 3am Tuesday morning. Our cats chased us around the house for a while, then we crashed for 3 hours. Anne had an appointment to take the car in for maintenance at 7am. Yawn. It was _so_cold_ Saturday night we could hardly stand it. It helped us decide to get out of there and head home. Saturday all day it was foggy at our house in Pebble Beach. But when we drove highway 68 up and over the ridge east toward Monterey the fog disappeared instantly on the east side of the ridge and it was perfectly clear. Sunday was a drop-dead beautiful day. Clear, sunny, warm, on both sides of the ridge. We almost didn't need heavy jackets at the shows (almost). I wore a bright, bright collar shirt Saturday night. Then Sunday night a guy sitting in the row in front of us had the exact same shirt on! I talked to him a bit and we both bought our shirts at Territory Ahead. He said he saw me on Saturday with his shirt on and was glad he decided to wait a day. We'd have looked like twins! We were sitting at the arena stage when this huge mass of fog started drifting over the stage area from the back. Uh oh, the fog was rolling in. But no, it wasn't fog, it was BBQ smoke from the Thai Barbeque booth. Oh boy it was the best smelling fog I _ever_ smelled! The average age of the attendees was quite old, maybe 45-50. There were a lot of ethnic diversity and everybody got along and were courteous and friendly. There were much fewer teenagers (until the high school competition on Sunday, then they were everywhere, and _so_ enthusiastic!). It was very, very crowded on the main drag through the fairgrounds. We could walk off the paved area and that was a little better. 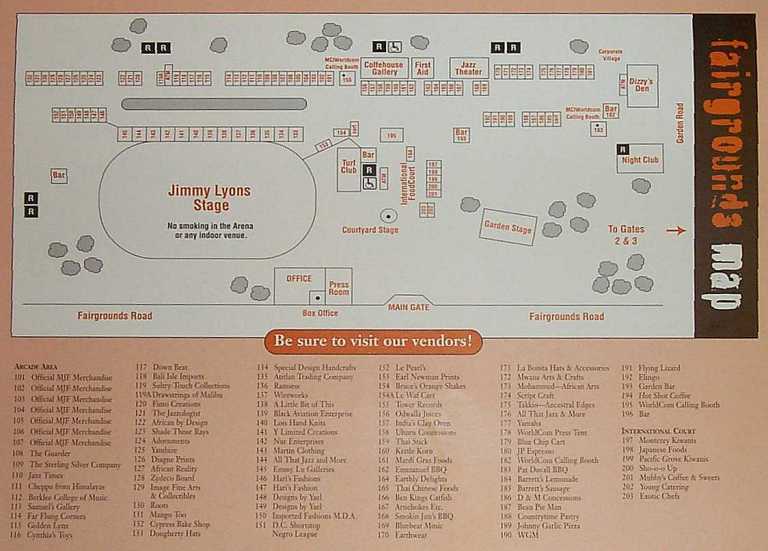 On Sunday we discovered a straight path in back of the booths that ran the entire length of the fairgrounds. It was literally 15 steps away and almost completely clear of people! You could see them through the booths, packed onto the main paved area, while this back way was paved, clean, and clear! 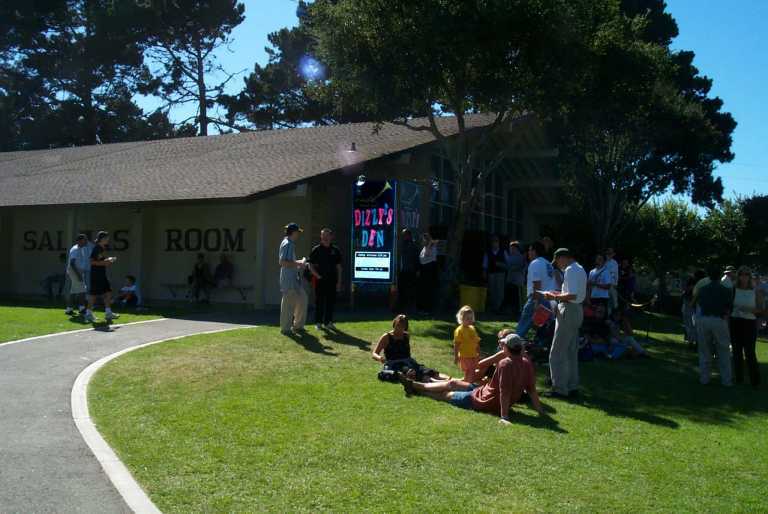 We would shunt onto this path at Dizzy's Den at the far west end of the festival grounds and walk quickly and unimpeded to the far east end of the grounds in about 2 minutes to arrive at the Arena Stage. Too bad we didn't discover this until Sunday! We both found that going to our favorite performers was maybe not such a good thing. We were disappointed by our favorites and discovered new performers that we both really liked! Next year we'll probably go about the festival differently, trying to hit the artists that we don't know. 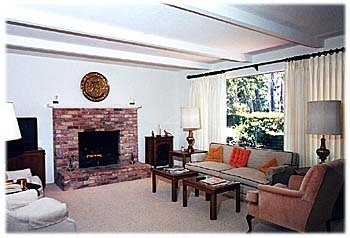 The Pebble Beach house was _so quiet_. I had a hard time getting used to that. We could have the windows open and not hear traffic or kids, or dogs barking, or anything!